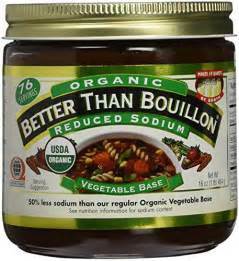 Organic Vegetable Stock Base 16 oz - Better Than Bouillon. Concentrated - Each jar makes 76 servings. 1 table spoon = 1 cube or 1- 8 oz can. Makes 19 quarts of broth.